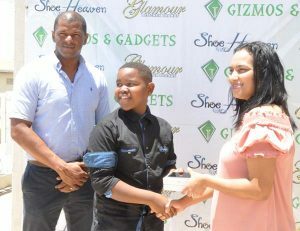 Gizmos and Gadgets Sales Manager Sophia Dolphin presents the smart phone to Kaysan Ninvalle in the presence of GTTA president Godfrey Munroe. Jamaica. The entity presented Ninvalle with a Samsung S7 Edge smart phone valued at $165,000 at a simple ceremony held at its location in North Road and Wellington Street, Georgetown. Ninvalle won Guyana’s only gold medal at the championships by defeating Jalen Kerr of Trinidad and Tobago 3-2. In presenting the prize to Ninvalle, Sales Manager Sophia Dolphin said they are happy to support the player and expressed delight at his achievement. She added that it’s their way of giving back to the society more so in the field of sports. President of the Guyana Table Tennis Association Godfrey Munroe spoke highly of Ninvalle, stating that he worked really for his success. He expressed gratitude to Gizmos and Gadgets, adding that it is heartening to see the entity recognising his achievement which will motivate other players. He added that the association will work towards helping his realising his full potential and will be looking at scholarship opportunities among other things. Munroe said that they will be sending a team to the upcoming senior Caribbean championships slated for Dominican Republic from September 4-9. He informed that the association is working on a couple of projects including a massive school programme towards the development of the sport. Ninvalle thanked the entity for their backing and said he will continue to work hard on his game so that he can achieve success at higher levels.